Apr. 1, 1999: Later this month NASA scientists will present initial results from an innovative program to catch meteoroids in flight through Earth's atmosphere. The paper, to be presented at the NASA/Ames Leonid Workshop on April 12-15, will describe tiny particles captured 20 km above Earth's surface during last year's Leonids meteor shower. During the peak of the 1998 Leonids, Dr. David Noever and colleagues from the NASA/Marshall Space Flight Center launched a 10m weather balloon into the stratosphere where it hovered for nearly 2 hours above 98% of Earth's atmosphere. The payload included a digital video camera and an xerogel micrometeorite collector, similar in some respects to the cosmic dust collector on board the Stardust spacecraft now in route to comet Wild-2. 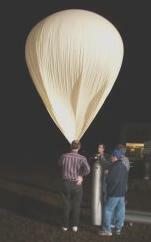 Right: NASA scientists prepare to launch a weather balloon from the Atmospheric Research Facility on the campus of NASA/Marshall during the 1998 Leonids meteor shower. The balloon lifted off at 2:28 am CST on Nov. 17, 1998. "The 1998 balloon flight was really intended as an engineering test," says Noever. "We wanted to see if it was possible to sample meteoroids -- or any kind of dust -- in the stratosphere and to evaluate the hardware in our payload before the 1999 Leonids." As it turned out, the 1998 flight was more successful than anyone expected. The video camera recorded a number of fireballs that were broadcast live on the web to nearly 100,000 people. Over 1,000,000 people saw the replay the next day. Left: A short video segment showing a Leonid fireball as seen from the stratosphere. It was recorded by a digital video camera carried aloft by the 10m weather balloon. That's not all. After the balloon payload was recovered, Noever and his colleagues used an Environmental Scanning Electron Microscope at NASA's Marshall Space Flight Center to examine the xerogel dust collector. They found 8 tiny craters created by impacts from particles measuring 20 to 50 microns in diameter. "Are they Leonid meteoroids?" asks Noever. "We really don't know at this point. The size of the particles is about what we would expect for meteoroids in the stratosphere, but they may also be terrestrial." Far right: a microscopic image of an impact crater discovered on the xerogel capture device. The crater measures 20-30 microns in diameter. Middle: an animated sequence showing microscopic slices of the crater at various depths. The answer at least partly lies in the chemical composition of the impactors. Particles like meteoroids that have entered the atmosphere at high speeds tend to be enriched in elements that are not easily vaporized by the extreme heat of atmospheric friction. The mass ratios Mg/Si, Al/Si and Fe/Si along with isotopic abundances can usually be used to distinguish terrestrial from extraterrestrial particles. "The way the impactors look is important, too" continued Noever. "Meteroids that have been partially melted by atmospheric friction often have a translucent rim surrounding an unmelted, opaque core. Right now we're studying both the appearance of the impactors and their chemical makeup. Hopefully we'll have an answer soon." Meanwhile, Noever and his colleagues plan to launch an identical balloon this month, on April 10, to sample the dust environment of the stratosphere when the Earth is not passing through a major meteoroid debris stream like the Leonids. "During the first quarter of every year there's a minimum of meteor activity," explains Dr. Tony Phillips, a NASA astronomer. "Earth doesn't pass through any major cometary debris fields from about Jan 15 until late April of each year. There's nothing special about those months. The low meteor flux during that time is just a result of the random distribution of comet debris trails in the solar system." The Ghost of Fireballs Past -- Dec. 22, 1998. RADAR echoes from Leonid and Geminid meteors. The 1998 Leonids: A bust or a blast? -- Nov. 27, 1998. New images of Leonid fireballs and their smokey remnants. Leonids Sample Return payload recovered! -- Nov. 23, 1998. Scientists are scanning the "comet catcher" for signs of Leonid meteoroids. Early birds catch the Leonids -- Nov. 19, 1998. The peak of the Leonid meteor shower happened more than 14 hours earlier than experts had predicted. A high-altitude look at the Leonids -- Nov. 18, 1998. NASA science balloon catches video of 8 fireballs. The Leonid Sample Return Mission -- Nov. 16, 1998. NASA scientists hope to capture a Leonid meteoroid and return it to Earth. Great Expectations: the 1998 Leonid meteor shower -- Nov. 10, 1998. The basics of what the Leonids are and what might happen on November 17.